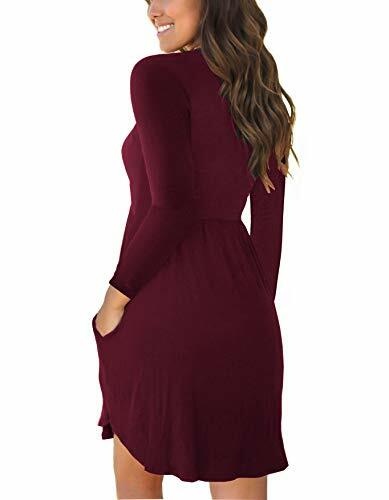 We are swooning over this stylish long sleeve round neckline dresses! We have Black/Purple gray/Navy blue/ Wine red/Dark green and Royal Blue to choose from? With a jacket or high boots will make it look perfect and try adding a dainty necklace and fun tassel earrings to finish off your look. Easy to dress up or down? 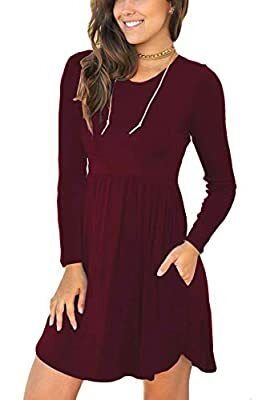 * Small:Bust 33.1",Sleeve:23.2",Waist 26.8",Length 32.1"
* Medium: Bust 35.0",Sleeve:23.6",Waist 28.7",Length 32.9"
* Large:Bust 37.4",Sleeve:24.0",Waist 31.0",Length 33.7"
* X-Large:Bust 39.8",Sleeve:24.4",Waist 33.1",Length 34.4"
Attention:Colors may appear slightly different via website due to computer picture resolution and monitor settings. 95%Rayon,5%Spandex Size:Small/US 4-6,Medium/US 8-10,Large/US 12-14,X-Large/US 16-18 Features: round neckline,long sleeve,elastic band at waist,two side-seam pockets,above knee length,solid dress,high waisted.Perfect dress for casual,party,vacation, streetwear and daily life. Approx. Length (shoulder to bottom hem): -Small: 31.9'' -Medium: 32.7'' -Large: 33.5'' -X-Large: 34.3'' Model is 5'5, 32 B bust, size 2/4 pants, size small top and is wearing a size small.